This rarely available Thornwood ranch with all new beautiful hardwood floors is customized, expanded & wonderfully upgraded with an expansive & open floor plan that is ideal for entertaining family & friends. The kitchen has 42" cherry cabinets, stainless appliances, a large island, granite counters & hardwood floors. A spacious & open family rm w/fireplace, tray ceiling & beautiful sweeping views of the Championship golf course's 14th fairway. Formal living & dining room, private office w/custom built-ins & plenty of natural light. An elegant master suite w/great closet space & spa bath w/soaking tub & separate shower. Huge deep pour basement w/9' ceiling perfect for future expansion! Classic brick exterior, beautifully landscaped, 2 car garage, large concrete patio & sunset views. Enjoy Country Club amenities & a links style golf course Designed by Arnold Palmer. Lawn care, snow removal, tennis courts, swimming pool, restaurant & exercise facilities all INCLUDED! 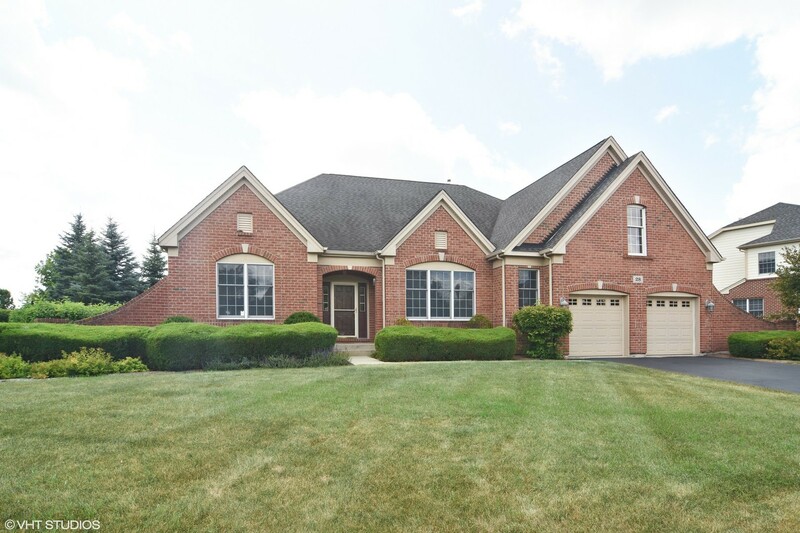 This Hawthorn Woods, Illinois Detached Single is located at 28 Championship Parkway in Hawthorn Woods Country Club and has 3 bedrooms, 2 full & 1 half bathrooms with approx 2,758 square feet and a Full Unfinished Basement. It has been listed For Sale on Blue Fence for 72 days and is currently Cancelled on the Multiple Listing Service (MLS#: 10270442) with a list price of $ 449,900 or a price per sqft of $ 163. 28 Championship Parkway is located within the Hawthorn Woods City Limits, 60047 zip code and in Lake County Illinois. The Detached Single property was built in 2005 with a lot size of 1.0-1.99 Acres and has Garage with 2 Spaces. School age children living at 28 Championship Parkway would go to Elementary School at Fremont Elementary School (District 79), Middle School at Fremont Middle School (District 79) and High School at Mundelein Cons High School (District 120). Do you have questions about 28 Championship Parkway in Hawthorn Woods? Learn more about this property and other Hawthorn Woods real estate for sale by contacting the best high selling real estate agents REALTORS® with awarding winning Blue Fence Real Estate. Simply request more information from a top rated Blue Fence REALTOR® or browse all of the most updated listings of Hawthorn Woods Homes For Sale. I was searching on Blue Fence and found this listing. Please send me more information about 28 Championship Parkway, Hawthorn Woods, Illinois 60047. Thank you. Copyright 2019 Midwest Real Estate Data LLC. All Rights Reserved. The data relating to real estate for sale on this website comes in part from the Broker Reciprocity program of Midwest Real Estate Data LLC. Real Estate listings held by brokerage firms other than Blue Fence Real Estate are marked with the MRED Broker Reciprocity logo or the Broker Reciprocity thumbnail logo (the MRED logo) and detailed information about them includes the names of the listing brokers. Some properties which appear for sale on this website may subsequently have sold and may no longer be available. Information Deemed Reliable but Not Guaranteed. The information being provided is for consumers' personal, non-commercial use and may not be used for any purpose other than to identify prospective properties consumers may be interested in purchasing. Updated on April 24, 2019 08:54 PM.